The top Republican on the Senate Finance Committee on Monday said an across-the-board freeze on federal spending is needed to reel in President Obama´s massive budget plan, signaling a more active Republican stance in fighting the president’s agenda. Sen. Charles E. Grassley, Iowa Republican, also said the president is pursuing a “socialist” form of government that will stifle the free market. Mr. Grassley told editors and reporters at The Washington Times that a spending freeze is necessary to get the federal deficit under control and to show voters that the government is capable of living within its means in hard times. “What you get when you have an across-the-board freeze is everybody is seen as contributing something,” Mr. Grassley said. “Congressmen don’t get an increase in [pay], government pensions don’t go up, you don’t charge senior citizens more for their Medicare premium than you did the year before,” he said, adding that a three-year freeze would produce a more dramatic effect. As the ranking Republican on the Finance Committee, Mr. Grassley figures to play a central role in the fate of some of the president’s top priorities, including tax reform, health care and energy. Mr. Grassley’s collegial relations with Chairman Max Baucus, Montana Democrat, only increases his clout. Sen. Charles Grassley is so angry over AIG bonuses that he says the executives should resign or kill themselves. Senator Chuck Grassley (R-IA) said on Monday the calls to his office were 8:1 against the stimulus. Other Senate offices report similar call ratios. Polls show that 50% or more of the voters are against this stimulus. The stimulus will probably still pass. After all, Democrats control the House and the Senate. But their will be consequences of the stimulus: political and economic. Barack Obama is bleeding politically. He’ll need some recovery time. 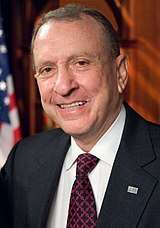 Senator Arlen Specter (R-PA) has been willing to go with the Democrats on the stimulus. He faces reelection in his state during the next go round; and his Republican base is not overjoyed with this stimulus. Senators Olympia Snowe and Susan Collins of Maine, both Republicans, have also sided with the Democratic Party on the stimulus. They probably have to help the Democrats (or think they have to) given the unemployment in their state. But this stimulus is going to hurt the nation, politically and economically. And few Demcrats or White House spokesmen have been able to articulate the benefits enough to turn around the negative feelings among voters…. In the gauzy days of bipartisan good feeling before his Inauguration, there was talk of President Barack Obama linking arms with Republicans to pass a massive stimulus bill, with a big bipartisan Senate majority as proof the parties could come together in a time of national distress. Now Obama and the Democrats are poised to push through an $827 billion package Tuesday with as few as three Republican votes in the Senate, after notching zero on the House side. If Obama signs a stimulus bill that has been approved on a party-line vote, “which I have no confidence will work, then I think this is very serious blow early on to his presidency,” Cornyn said. Sen. Carl Levin (D-Mich.) acknowledged the lack of bipartisan support “weakens the bill” and said voters should try to withhold judgment until a final product emerges from conference. But he warned that the GOP would suffer from withholding support. Yet Republicans are gambling themselves — and perhaps with even higher stakes. Still seeking a way forward from their Election Day thumping, they risk appearing out of touch as the unemployment rate jumps to 7.6 percent and a popular new president is appearing to seek their support to address the crisis. By turning their backs on him and opposing action at a time when millions of Americans are in need, they may invite a “party of no” bull’s-eye on their backs. It was clear yesterday that the White House was trying to demonize Senate Republicans on their slow response to the economic stimulus. The president himself predicted “catastrophe” if the federal economic stimulus is not passed quickly. White House spokesman Robert Gibbs seemed to carefully choose his words to paint Republicans as the the real problem here. If the stimulus is so great why did the President of the United States have to write his own defense of the stimulus for the Washington Post? If the stimulus is so great why do 50% of Americans no longer think so? And all the demonization of Republicans sounds good until you listen to Senate Democrats defend the stimulus bill. There aren’t any. Where’s Harry Reid? Too busy to defend the president’s legislation as handed down by Nancy Pelosi and the House? Senator Kent Conrad (D-NK) said today that he is making an alliance with Republicans to cut the most egregious provisions out of the stmulus. Egregious parts of the stimulus, says a Democratic Senator. While his president predicts castrophe if those same provisions are not passed…. Grassley and others want more time to review the House version of the stimulus or they want a new bill all together…. President Obama keeps pressing on the gas, hoping things will go faster. Many are saying that few in the House even read through the stimulus — relying instead upon the president explaining the crisis and the spending solution. “We’re not trying to prevent a package from passing. We’re trying to reform it,” Senate Republican leader Mitch McConnell said. Maybe a time out is in order…. We watched the U.S. Senate “debate” the economic stimulus with interst today. We’ve been watching the House and Senate off and on since 1972. But today, a frustrated Republican did something we had never seen before. Senator Chuck Grassley, the Republican from Iowa, was making his case against the stimulus when he stopped, apparently out of time. The rare show of emotion and disillusionment was striking to us after all these years, and probably indicative of the Democratic control of the White House, the House and the Senate — and how the Republicans are feeling these days. 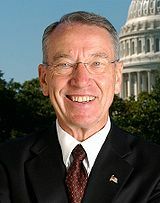 Grassley had made the case that more time is needed to consider the stimulus. “We need to look before we leap,” he said. Grassly was demoralized, it seemed to us. You are currently browsing the archives for the Grassley category.